Our hometown heroes really rock the Roanoke Valley! 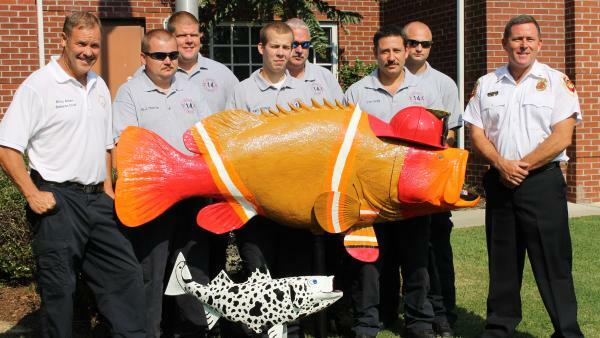 The Roanoke Rapids Fire Department recently released their fireman fish that is accompanied by a small Dalmatian fish, their new mascot, both painted by artist Leary Davis. In addition to actually fighting fires, the RRFD rocks the Roanoke Valley by doing public education that includes fire prevention, conducting fire extinguisher classes, conducting in-home inspections and fire inspections, doing pre-fire surveys of buildings to know the exits and pathways, doing smoke detector installation and, as Acting Chief Stay Coggins said, “training, training, training.” Beginning September 1, the RRFD will also begin first-responder duties. All of this ensures that the RRFD is here to serve the citizens and prevent fires, but if there is a fire, they are well-prepared and well-equipped to put it out. The RRFD began as a volunteer fire department in 1915, and the first fire truck was purchased in 1929. The RRFD became a paid department in 1934 with J.A. Lipscomb as Chief and 20 additional employees. Today, there are 33 employees of the RRFD, all of whom have the mission to improve the quality of life for the citizens of Roanoke Rapids. To help in their efforts to prevent and put-out fires, the RRFD has four command staff vehicles, a ladder truck, two pumpers, a brush truck, a service truck and a fire safety house for conducting fire prevention education. The employees and equipment are located at two fire stations on opposite sides of the city. The W. Lunsford Crew Fire Station on Roanoke Avenue was opened in 1998. The Drewery N. Beale Fire Station on Highway 125 Extension opened in 2008. For more information about the RRFD, visit www.cityofroanokerapids.com and click on City Departments.